The Spikes Tactical Forged AR-15 lower receiver is perfect for your next AR-15 build. 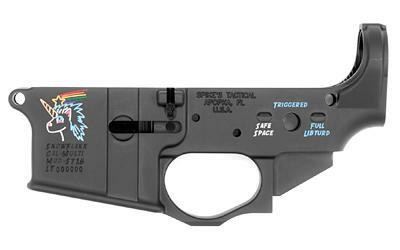 This particular lower receiver features the Unicorn Logo which has been color filled. The lower is made from 7075 T6 aluminum and is finished with a Type III hard coat anodized finish. Similar to Spike's other mil-spec offering this lower features a low shelf for RDIAS and is marked as "Multi" caliber.